Grand Scale brings to light rare surviving examples of mural-size prints-a Renaissance art form nearly lost from historical record. The most famous 16th-century woodcuts, engravings, and etchings were those done on an intimate scale. Yet artists also worked in another entire category of print production, producing mural-size prints that sometimes reached as high as ten feet. This handsome book, which features nearly fifty examples from Italy, Germany, France, and the Netherlands, explores these multi-block woodcut and multi-plate engraving ensembles as vital contributions to the visual culture of their time. 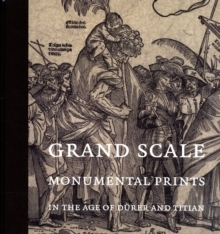 Comprising five essays, Grand Scale documents the relationship of monumental prints to the history of prints in general and also to mapmaking, painting, and book illustration, while addressing image design and modular printing from multiple, repeating blocks.